Constantinia Georgala, 91 years old today, was born in 1920 in the Phanar section of Istanbul (Constantinople). She was baptized in the Church of Panagia Mouhliotissa next to the Patriarchal School and in 1922 left Turkey with her parents during the population exchange with Greece. Today she lives in Thessaloniki. Recently she returned to Constantinople after 90 years to see where she was born, and had a moving experience. "I came to see the land where I first opened my eyes, where I saw the light of life" Constantinia said as she was about to enter the Patriarchal Church of Saint George. "God made me worthy to return, may His name be glorified." 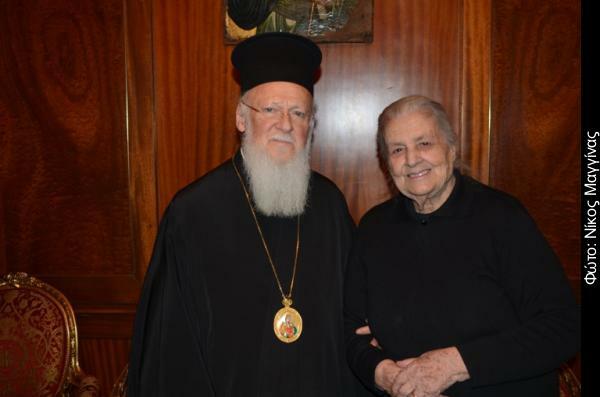 Ecumenical Patriarch Bartholomew welcomed her personally, saying: "Constantinia in Constantinople". When he asked why she didn't come sooner, she said: "Obligations and other things did not give me a chance. Now God made me worthy."